Our Craps Layouts are made of casino quality green Billiard Cloth (Mali). 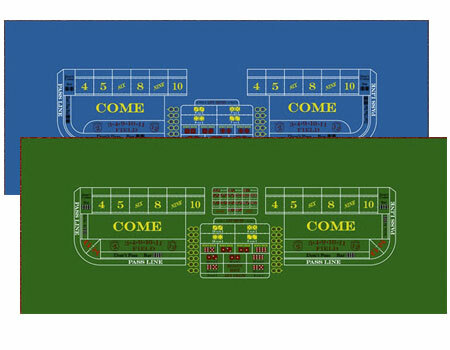 Backed and Un-backed Craps Layouts are available in the following sizes: 6', 8', 10', 12', and 14'. All Billiard Cloth Craps Layouts measure 62" wide. SALE - Single Dealer Green and Burgundy Layouts. Now $114.86! SALE - Single Dealer Green Backed Layouts. Now $114.86! These Home-Style Craps Layouts are made of high quality 2-millimeter thick felt. Each layout measures 3' by 6' and features an overall casino green color.